Design your own canvas in 3 simple steps. You have the option to collect it in-store, or have it delivered to your door. Your imagery will be printed on high quality canvas and mounted to a wooden block. You should use original photographs from a camera wherever possible. Photos taken from Facebook or the internet will probably be low resolution and won`t look good. Canvas prints are now 3 for the price of 2 until 31st December 2016. 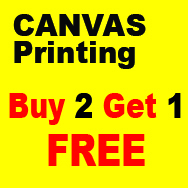 To avail of our buy 2 get 1 free offer purchase your 3 canvas prints and immediately ring one of our stores and we will refund you for the cheapest one.